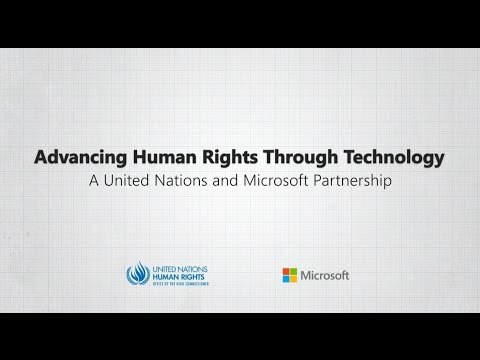 NEWS PROVIDED BY Microsoft Corp.
GENEVA and REDMOND, Wash., May 16, 2017 /PRNewswire/ -- The Office of the UN High Commissioner for Human Rights on Tuesday announced a landmark five-year partnership with Microsoft Corp. As part of the agreement, Microsoft will provide a grant of $5 million (USD) to support the work of the UN Human Rights Office. This represents an unprecedented level of support from a private-sector organization. "As a global company that sees the problems of the world, we believe that we have a responsibility to help solve them," said Microsoft President Brad Smith. "We have an untapped opportunity to use the power of technology to collect data, analyze that data and equip the United Nations to advance human rights around the world." One example is Rights View, an information "dashboard" that will allow UN human rights staff to aggregate large quantities of internal and external data on specific countries and types of rights violations in real time. It will help facilitate analysis, ensure early warning of emerging critical issues and provide data to guide responses. This tool, powered by cloud computing and big data analysis, is just one example of the potential for technology to be a force for good. "This could be a truly groundbreaking agreement," said UN High Commissioner for Human Rights Zeid Ra'ad Al Hussein. "We live in a rapidly evolving age, where technology can either be used to solve human rights problems or misused to erode human rights. Similarly, companies can infringe people's rights, or they can be a major progressive force." "The private sector has an essential role to play in advancing human rights, and this partnership with Microsoft demonstrates how we can join forces in a constructive way," Zeid said. "I hope this is just the beginning of something much bigger: that it helps stimulate a broad movement by the private sector to stand up for human rights. Increased support from major companies in the technology sector and other fields can clearly make a critical difference."